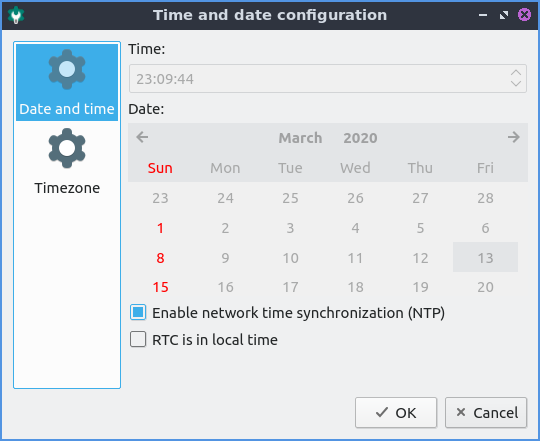 Date and time is a program that lets you change your timezone toggle whether to get the time automatically and change the date if you are not connected to a network. The tab for Date and time sets what time it is and settings for synchronize it via the network. If you want to toggle synchronizing the time of network check/uncheck the Enable network time synchronization(NTP) check. 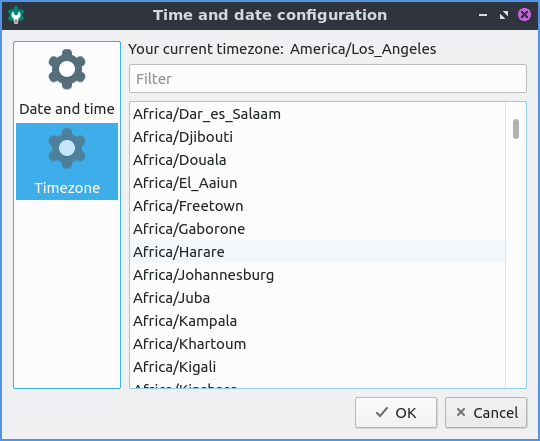 To change the timezone of your computer left click the Timezone tab and select your time zone from the long list. The checkbox for RTC is in local time is for the real time clock on your motherboard being in local time rather than UTC. If you do not wish to synchronize your clock via network time protocol uncheck the Enable network time synchroniziation (NTP) checkbox. Once NTP is disabled you want to be able to change your time locally you will be able to change your time by typing your time in the correct time. To cancel your changes to in date and time press the Cancel button. Lubuntu ships with version 0.14.1 of Date and time.